Alexandra Burr‘s pendant light is a simple design that reclaims a 2×4 and transforms it into a modernist lamp with an industrial yet subdued look. The salvaged 2×4 has been whitewashed to add a softness to the lamp’s surface aesthetic, and a monofilament suspension line further lightens the mass of the form, making it appear to almost float in the air. A LED strip improves energy efficiency, and a frosted glass lens diffuses light beautifully throughout a room. Through an interesting play between weight, material and illumination, the 2×4 makes for a unique and modern lighting solution. The design above was submitted to us by an Inhabitat reader. Want to see your story on Inhabitat? Send us a tip by following this link. Remember to follow our instructions carefully to boost your chances of being chosen for publishing! Alexandra Burr's pendant light is a simple design that reclaims a 2x4 and transforms it into a modernist lamp with an industrial yet subdued look. The salvaged 2x4 has been whitewashed to add a softness to the lamp's surface aesthetic, and a monofilament suspension line further lightens the mass of the form, making it appear to almost float in the air. A LED strip improves energy efficiency, and a frosted glass lens diffuses light beautifully throughout a room. 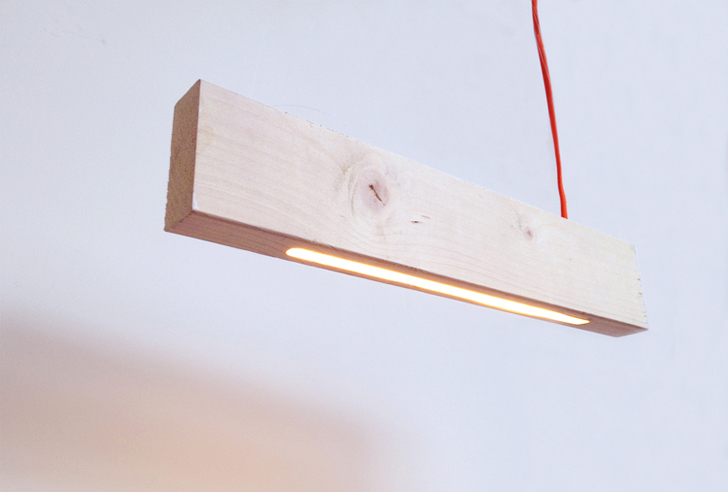 Through an interesting play between weight, material and illumination, the 2x4 makes for a unique and modern lighting solution.